From the very first computer science school lessons, we know the basic idea of the IT world: hardware is a heart and software is a soul of any system. The modern digitized society highly depends on such systems and the Internet as literally all industries utilize them. Also, there is no secret that IT experts have one of the highest salaries with nearly $5500 per month. As a result, the IT sector attracts a lot of people and most of them ask the first question: how to make a software app? This guide is designed for everybody interested in the process of software development and includes key points dedicated to step-by-step strategies of creating a product, specific programming languages, desktop and mobile applications, and exact prices. Read on to find how to create your own software without programming by cooperating with developers’ teams and outsourcing companies. Let’s begin with basic insights on how the development process is built and what essential parts it includes. Basically, all software products including custom apps and enterprise solutions feature a similar set of steps: the initial market analysis, planning, designing MVP, releasing and upgrading the product, and supporting it. Thus, if you are wondered about how to create a software application, be sure to start with exploring this scheme to figure out how things work. Then it will be possible to apply the universal algorithm to your own purposes because each software system is unique and different from other examples. The first challenge appears at the very beginning. What if you don’t have enough skills to turn the idea into the working product? What if you have no time to learn languages and want to create your own software without programming? In this case, consider working with outsourcing developers. We carefully follow all steps to deliver the fully-functional product which will successfully enter the market and reach the set goals. Unlike other outsourcing teams, we focus on the final result instead of inefficient overextended projects with an hourly rate because we don’t sell time, we sell working and profitable products. Starting with the analysis, our experts utilize the agile development principle with monthly milestones which allow you to track the process. We ensure an on-time launch and exact accordance to your requirements. Overall, this means that we want to make the perfect product no less than you. Now, look at each stage in details, so you will get the idea on how to make a software product. Research of the product. Consulting analysts find the potential strengths and weaknesses of the idea, list solutions and proposals on how to create a software application which will be more competitive. Research of the market. Business analysts carry out global investigations to make your product successful and find the best niche for it. Basin on the market study, consultants also may provide additional ideas. It doesn’t matter if you are looking for strategies focused on how to create software for Android, iOS, cloud platforms or desktop systems because the research stage is crucial. All products interact with customers and other systems, so they have to be unique and, so it will survive in the permanently evolved world of IT. Despite researching departments should update their results regularly due to the changing nature of the market, developers can start the development stage right after the first report. This step includes the careful planning of the upcoming software platform and discussing of all possible questions related to the customer’s idea and developers’ proposals. For instance, you may ask how to make as software using C++ but the team will suggest using the Java basement. This moment is perfect to talk about differences and reach a final decision because later it will be more difficult to modify anything. Really, nobody like these customers who change their mind right before the launch! The audience and user needs. This point is where the magic happens. During the development stage, smart folks write and compile code, integrate the desired features, test systems, and upgrade them. Following the current trends focused on how to make a software system perfectly-working, developers utilize principles of DevOps, Agile, and MVP (aka Minimal Viable Product). DevOps stands for integrating and automating the interaction between different IT teams while Agile focuses on the numerous iterations during the development process. MVP is the most popular idea of the modern IT sector. It provides for the initial creating of the most basic product which includes only a few key features. But this product has to be perfectly tested and devoid of flaws or bugs. According to this approach, you can create your own software without programming in a short time by partnering with a team of developers. Further, MVP will be upgraded with extra features, so you will maintain the users’ interest and provide them new unique experience over time. Obviously, the next step is related to updating and releasing the previously created Minimal Valuable Product. Here, everything is discussed again as you can ask for some additional functions before the first release or enter the market with pure MVP only. Honestly, the ideal project is never finished because there is always a space for new extensions. For instance, the team can launch the alpha to familiarize customers with your product, and then continue working on the upcoming beta with even more features. Thus, this stage divides into several consecutive releases and upgrades. As we have mentioned, development doesn’t stop as it is a continuous process. Starting from your first question (like, how to create a software using Java or any other language), programmers will work on the product all the time. Apart from introducing new stuff, they will focus on supporting and maintaining the system, so it will remain stable regardless of the number of customers. Additionally, all-in-one companies including our team provide for testing, QA, and analyzing the changing market for the lifelong support of the product. At all, the whole scheme of software creating software is built around constant researching, upgrading, evaluating, and fixing the application. To understand the idea of product creating, it is crucial to know about coding. Put simply, it is the stage where the product is created because programmers write instructions for computers according to which future programs will work. There are several programming languages which differ by syntax (how instructions look) and semantics (what instructions mean), so developers can choose the best tool for each customer’s needs. Obviously, a single person can barely know all languages, so companies hire different specialists: one knows how to make a software using C++, another learns Python, and so on. Embedded – working with so-called smart devices with built-in electronics. Languages: Assembly, C++, Java. Enterprise – designing applications and platforms for large business management. Languages: J2EE (Java Enterprise) and .NET. GameDev – literally, creating various games including offline and online projects. Languages: C++, C#, Java, and languages for Web programming. Mobile – mainly, creating apps for Android and iOS. Languages: Java and Kotlin for Android, Objective-C and Swift for iOS. Remember that learning a programming language is not a simple task. It is similar to mastering a regular foreign language as you have to remember various rules and elements like variables, conditionals, loops, escapes, comments, expressions, and more, and more. It is also impossible to create your own software without programming unless you contact a developers’ team. For all who want to study coding independently, the Internet offers educational platforms like Codeacademy, Code.org, and the greatest programming resource – GitHub. For now, we will focus on two highly popular languages which are widely used for designing soft: C++ and Java. C++ was designed like an ancestor of C with more focus on general-purpose and object-oriented programming. In 2018, IEEE Spectrum collected data from 10 sources like GitHub, Google Trends, and Reddit to place C++ on the 2nd place with 99.7 rating! However, the popularity among Stack Overflow develops was fewer – only 25.4% used the language (10th place). 2019 TIOBE and PYPL indexes based on web searches put C++ on the 4th and 6th place, respectively. Rich and powerful – includes tons of functions and possibilities. Fast – currently, C++ is one of the fastest and energy-efficient languages. Portable – code can run on any machine but must be written for a specific platform. Object-oriented – similarly to Java, C++ is based on objects’ types. C++ is known as the language for low-level system/embedded programming and general desktop/web platforms. For example, it is used for designing operating systems, browsers, databases, compilers, and more general baking and cloud apps. Answering the question of how to make a software using C++, we can mention relatively high difficulty and significant knowledge requirements, so you definitely want to check something simpler. Java is an object-oriented universal language which derives its syntax from C and C++. Despite it is less focuses on low-level development, Java pushes the WORA (Write Once, Run Anywhere) idea to make applications more independent. In 2018, IEEE Spectrum put Java on the 3rd place with 97.5 rating. As well, only 45.3% of Stack Overflow developers used Java usage – it is the 5th place. 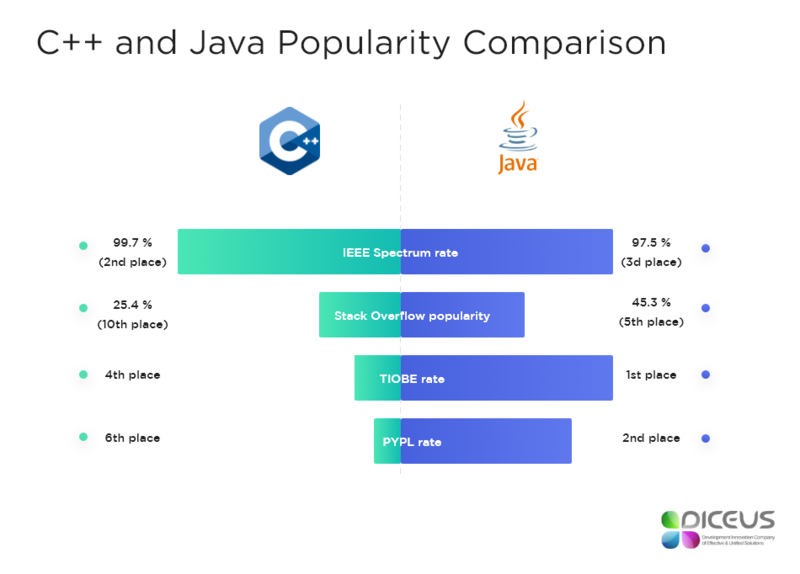 According to 2019 data of TIOBE and PYPL, Java was on the 1st and 2nd places, respectively. Simple – without rare complicated features of C++ but with automatic garbage collection. Object-oriented – everything is based on different types of objects. Independent – Java feature bytecode which can run on different platforms. Secure – Java-based software runs in virtual machines with higher protection. For business needs, there is a platform called J2EE or Java Enterprise – a Java-based set of standards and specifications which provides for creating enterprise products. J2EE is a wonderful tool as it guarantees high performance, scalability, and reliability. Specifically, it focuses on interacting with web systems including local networks and the Internet. 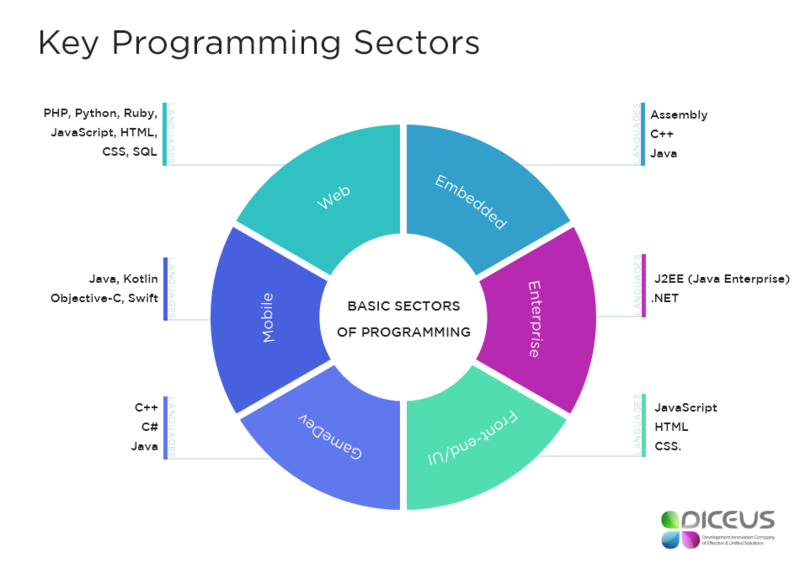 Projects like Amazon, eBay and LinkedIn are based on J2EE, mostly. Means, if you have a large business and want to create your own software application without programming, ask teams which use Java Enterprise. C is one of the first languages ever which is still used for creating low-level software. It is suitable for embedded systems thanks to the heavy orientation on hardware. C# is really close to Java and C++ but designed by Microsoft developers. That’s why it is popular among Windows and Windows Phone developers. Objective-C is another language from the C family. It is a native design of Apple engineers, so it is used for iOS systems. Python is a pretty simple and easy-to-learn language which is useful for prototyping, expanding the functionality, and creating math or business intelligence tools. PHP was released in 1995 but it is still popular for web development. The majority of modern hosting providers support this language. Although HTML (a markup language) and CSS (a style language) aren’t pure programming languages, they are useful for all who want to know how to create a software application for the Internet. At times of the great mobile community and users who do nearly everything on the go, businesses and customers increase their interest in mobile applications. They expand the experience and deliver your products/services with a higher level of personalization. 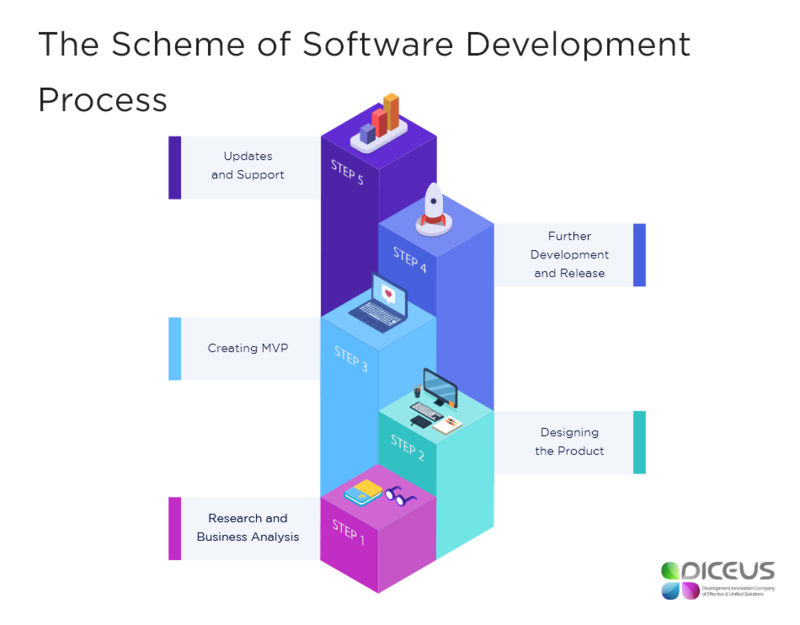 The process of development is similar to the described above as it also includes stages of market analysis, planning, creating MVP, releasing, and upgrading. Generally, you will be interested in two questions: how to create software for Android and how to make it for iOS. Both platforms feature own languages, so different developers are responsible for creating apps. We engage in native development for Android or iOS, cross-platform development, consulting, testing, and supporting. Products are delivered to official sites or app stores quickly to meet the current market needs. The sector/technology. Basically, it depends on the language chosen. The needs and features. For example, hosting, databases, APIs, mobile apps. Time limits. Obviously, urgent projects come with higher rates. Also, consider the location of your business, extra needs, and additional subsequent services like training employees, marinating and supporting the product. As we talk about turnkey solutions and teams focused on the final result, hourly rates of freelancers are less important (still, you can check them at Upwork – one of the largest freelance markets). 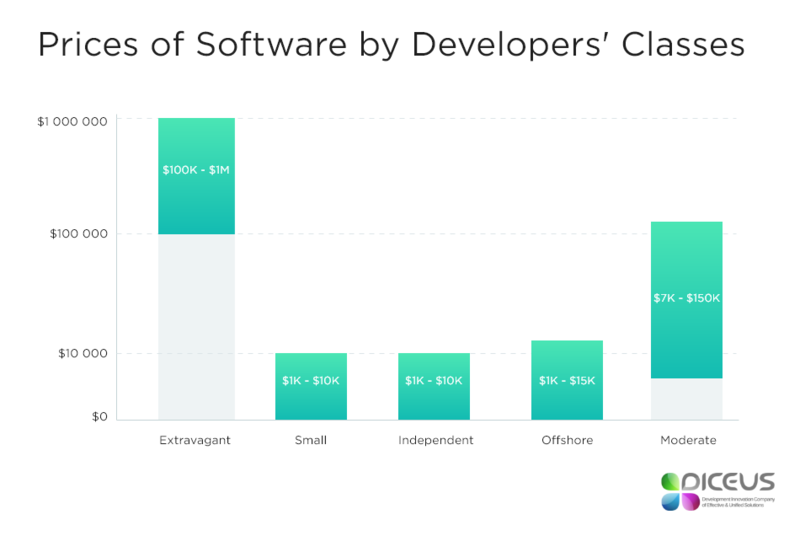 As for the projects, Comentum lists five classes of software developers with different price ranges: Extravagant ($100K - $1M), Moderate ($7K – 150K), Small ($1K - $10K), Independent ($1K - $10K but with higher range of hourly rates), and Offshore ($1K – $15K and focused on the mass production). You also can evaluate average prices by reviewing developers’ salaries by regions. You may be interested in essential things to know to consider developer cost. At this moment, it looks that software is extremely difficult to create as they require a lot of things to consider. Thus, if you google «how to make a software product?», you will get guides dedicated to solo development. Obviously, they start with things like «learn a programming language» or «think what type of application you need». That is wonderful but it is possible that you need a product but have no time to code independently. In this case, two options are available: hire a freelance programmer or cooperate with a company. Freelancers can help with small projects or part-time employment but teams are indispensable for middle and large enterprise stuff. We offer the whole range of services from the business analysis to lifelong support of the released app. Our company rejects hourly rates to deliver exactly what you need right in time. We help to launch custom software systems which suit your purposes perfectly. Contact us now and you will get an initial business analysis.